On 2 June 1922 the New York Times, p. 35, reported, "Wood Dolson & Co. Will Erect Building on Upper Broadway. As a site for a building for its own occupancy the real estate firm of Wood Dolson & Co. has leased from the Rutgers Presbyterian Church the vacant plot on the west side of Broadway, between Seventy-second and Seventy-third Streets. The plot, which has a frontage of about eighteen feet and a depth of 169 feet, is located between the church and the Hotel St. Andrew. It is understood that the lessees will pay about $12,500 a year for a term of twenty-one years. There are certain restrictions on the property, and the architecture of the new structure must conform with the church building." Plans filed with the New York City Dept. of Buildings show that the new building was owned by the Rutgers Presbyterian Church, and the architects were F. R. & A. Ware & John D. Boyd. It was to be a 3-story fireproof building, and costs were estimated at $30,000 (Office for Metropolitan History, "Manhattan NB Database 1900-1986," (June 2011), http://www.MetroHistory.com). Wood, Dolson occupied this building from 1922 to 1939. From 1940 to 1956 their main office was at 241 W. 72nd St. In the mid-1950s they merged with L. J. Phillips & Co. to form L. J. Phillips Wood Dolson Co., which eventually changed its name to Phillips Wood Dolson Co., Inc. The last entry for Phillips Wood Dolson Co. in the Manhattan telephone directory was in 1968. Wood and Dolson were Frederick R. Wood (1868-1924) and William Hamilton Dolson (1880-1926). Dolson's obituary in the New York Times, 20 Sept. 1926, read, "William H. Dolson, President of Wood, Dolson Company, Inc., real estate operators, died on Saturday at his residence, 118 West Seventy-ninth Street, after an illness of four days. His funeral will be held in the West Park Presbyterian Church, Amsterdam Avenue and Eighty-sixth Street, at 2 P. M. tomorrow. Interment will be in Woodlawn Cemetery. Mr. Dolson, though only 46, had been conspicuous in business for years. He had long been identified with the development of the upper west side. He came to New York from Haverstraw and at the age of 15 entered the employ of the late Douglas Robinson as an office boy, later going to F. R. Wood & Co., then at Broadway and Eighty-seventh Street. He took charge of their management business, and later organized his own company, assuming charge of the Belnord apartments at Eighty-sixth Street and Broadway, then the largest apartment house in the world. When F. R. Wood & Co. dissolved partnership in 1911, Mr. Dolson and F. R. Wood formed the F. R. Wood-W. H. Dolson Company, Mr. Dolson becoming its Treasurer and later its President. In 1912 the name was changed to Wood, Dolson Company, Inc. Mr. Dolson was a member of the Lotus, New York Athletic, Ardsley Golf and Amateur Billiard Clubs, the Holland and Rockland County Societies and the Sons of the American Revolution. He leaves a widow, formerly Miss Anderson of Washington, two half brothers and two sisters." When Frederick R. Wood died in 1924, this brief death notice appeared in the New York Times, "Wood - At Haworth N. J. on Thursday, March 27, Frederick R. Wood, husband of Pauline L. Schurtz. Funeral services at his late residence, Haworth N. J., Monday, March 31, at 10:30 A. M. San Francisco papers please copy." In the 1910 U. S. Census Frederick R. Wood, age 41, born District of Columbia, lived at 316 W. 84th St. with his wife, Jennie M., son, Freeman N. and daughter, Janet. However, this seems not to have been a happy marriage. In 1919 the New York Times, 19 Aug. 1919, p. 10, reported, "Frederick R. Wood, real estate broker, formerly with the F. R. Wood-W. H. Dolson Company, was directed yesterday by Supreme Court Justice Hendricks to pay $50 a week alimony for the support of his wife, Jennie M. Wood, and daughter Janet, pending a suit for divorce... [Mrs. Wood] says she married the defendant in 1894 in Denver, and that he has an income of $20,000. They have not lived together since 1917... She said that her husband had transferred insurance taken out for her to Pauline Brunswick, who is named in the divorce suit and who, it is alleged, the defendant has been supporting at 202 West Eighty-third Street." In the 1920 U. S. Census Frederick R. Wood, 51, born Maryland, lived with his new wife, Pauline L., 42, born California, on Willets Pt. Road, Queens, N. Y.
F. R. Wood & Co. were founded approximately 1902 by Frederick R. Wood. Initially their offices were located at 412 Columbus Ave. 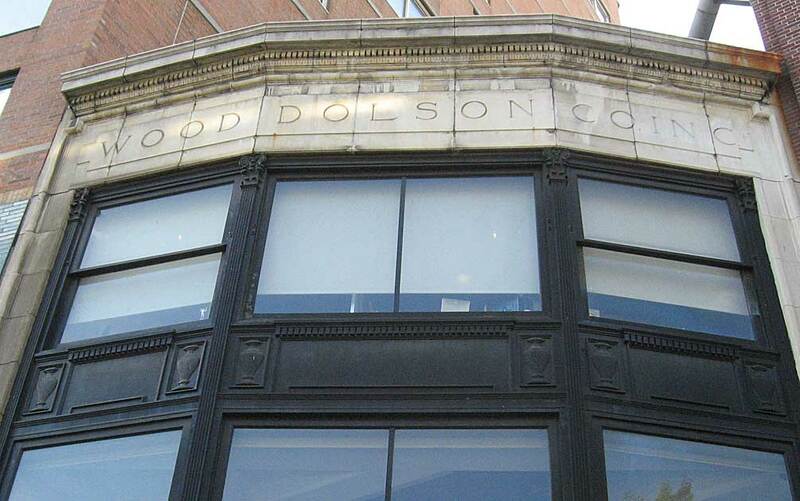 In 1912 Wood took William H. Dolson as a partner, and the new company was called F. R. Wood, W. H. Dolson Co. The main office was on the corner of Broadway and 80th St. (2240 Broadway). William H. Dolson, age 36, born 6 July 1880, registered for the World War I draft in 1918 when employed at this address. The company name was changed to Wood, Dolson Co. Inc. in 1919. By this time Frederick Wood had withdrawn from the partnership. The 1918 Directory of Directors in the City of New York listed the following officers at Wood, Dolson: William H. Dolson, Henry R. Hoyt, Walter B. Smith, and Henry S. Thompson. The same publication listed Frederick R. Wood as Secretary and Director at the Dorliton Corp., 2240 Broadway. Henry Soffe Thompson was described as a "capitalist" in Builders of Our Nation: Men of 1914, which also said, "born, N. Y. City, Aug. 10, 1873, son of Richard J. and Hellen (Soffe) Thompson; graduated from Princeton, A. B., 1894; married, N. Y. City, April 19, 1900, Mabel Potter; children, Dorothy, Adele, Henry S., Jr." Among others, Henry Thompson held positions with Belnord Realty Co., Boulevard Realty Co., Golden Hill Building Co., and Wood, Dolson & Co. He had also held several offices in city government: superintendent of buildings under Mayor Seth Low, commissioner of Public Works in the Borough of Manhattan under Mayor McClellan, member of the City Improvement Commission under McClellan, and commissioner of water supply, gas and electricity under Mayor Gaynor. Wood, Dolson were primarily engaged in apartment rentals on the west side of Manhattan but did some business outside the city. This ad for Wood, Dolson appeared in Country Life in America, March, 1915. A year later this one appeared in the May, 1916, issue of Country Life in America. Extensive West Side Manhattan rentals were listed beneath this heading in an ad from the New York Times, 1937.